Charcoal is a popular choice for grillers, but propane is the way to go if you want consistent heat. The best gas grills under $500 pack quite the punch–find them here. Can hold 29 hamburgers or 17 steaks! Two grills for the price of one! For consumers that need a portable propane grill. Stainless steel and Infrared technology are two highlights of this classy cooker. Built for the road with high powered burners and a sturdy wheeled cart. A budget-friendly three burner grill from Char-Broil. Fletcher is a freelance writer with a penchant for tools, tech, and toys. 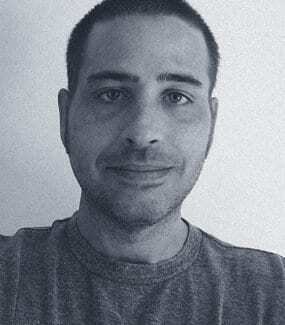 When not writing about smartphones and drills, he spends his time following the financial markets and waiting for Game of Thrones to return. No matter how hot it gets during the summer, you’ll find plenty of grills going in backyards across America. Charcoal is still popular, but gas grills are the way to go if you want quick even heat. They can be expensive, but the best gas grills under $500 still pack quite the punch. Whether you grill year round or just fire up the barbie on occasion, we have a gas cooker for you. We’ve even included a few exotic models along with a guide for beginners looking to buy their first propane grill. 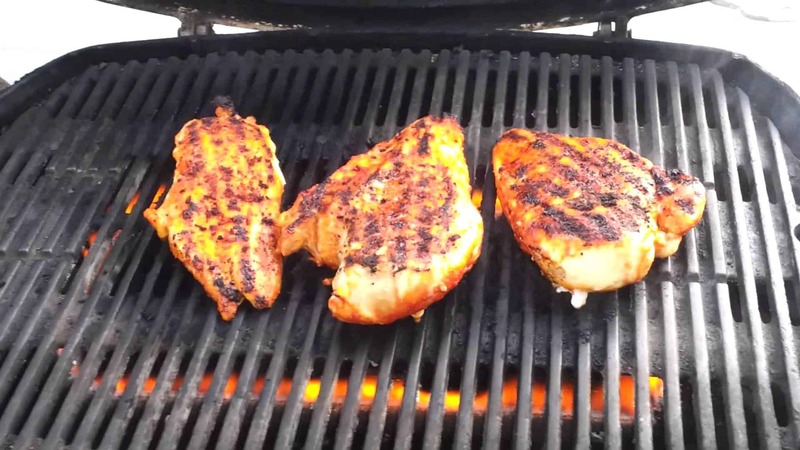 From burgers and steaks to shish kabob’d chicken, consumers have grilled every food you can imagine with the grills on our list. All our options had to provide a steady even flame for starters, but that was just the tip of the iceberg in our roundup of the top grills under $500. After our experts put together a list of over 30 grills, we started narrowing things down through verified customer reviews along with advice from the experts. We took our own staff’s experience in the grilling department into account as well before picking apart each model. 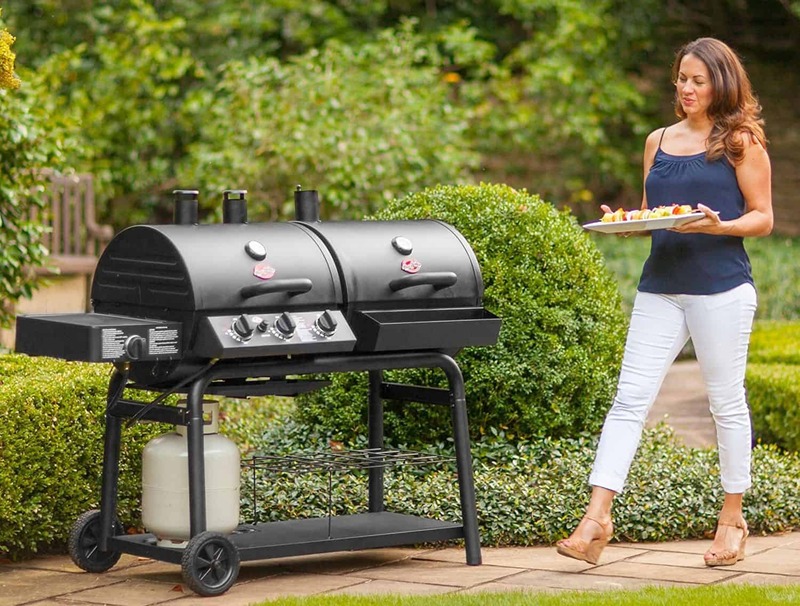 The firebox, warranty and grilling surface were just a few areas we covered in our research, and after careful consideration, we came up with a list of eight grills we feel stand out from the rest. Check what we refer to as the “size to burner ratio” before anything else. 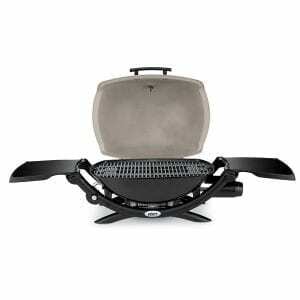 It’s one of the first things we considered as you don’t want a grill 36-inches long with a burner on each side. After that, take a look at what those burners are made of then take a long hard look at the frame. If you’re going to move the grill around a lot, you’ll want something sturdy – not a cheap tube frame with a handful of bolts. The cooking grates should be next on your list followed by the warranty. 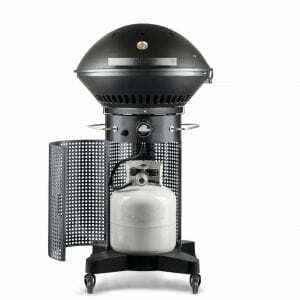 We decided to keep things simple and focus on a few select styles of propane-based systems in our grill buying guide. Even if you’re experienced under the lid and just making the transition from the world of charcoal briquettes, you’ll want to keep the following areas in mind. Do you grill for large parties of people or just fire up the burners on special occasions? If you love to put on a show and entertain guests frequently, you’ll want a larger grill capable of holding plenty of meat. On the flip side, if you only grill on holidays or take the seasonal approach, you may not need six burners and illuminated knobs. Whether you’re looking for something simple or throw block parties on the reg… We have a cooker for you. There are several types of grills available when you decide to roll with gas, but we’re only going to concentrate on a couple of styles and a variant this time around. 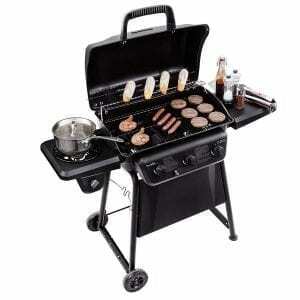 Medium Gas Grills – A regular or medium-sized gas grill are the ones most consumers will be familiar with. They’re cart-based grills that usually have wheels, but don’t break down (easily) so you’ll need a truck if you want to haul it around. There are a few exceptions to this rule, but the average weight is over 100 pounds sans the tank. They typically have anywhere from two to four burners depending on the style and size. Portable Grills – We’ve been toting around charcoal grills for years, and campers are also familiar with portable gas stoves and grills. Thanks to modern technology, you can now get a full-service gas grill you can toss in a trunk and carry around with ease. These little units are made to work with smaller propane canisters and have between one and two burners at the most. You can also adapt them to work with larger gas tanks and most have optional stands. There are several hybrid gas grills as well, and some have pretty interesting features. Infrared technology can ensure you get a nice even temperature with zero flare-ups, but isn’t something you really need to focus on. Want a gas grill with a smoker box or one that can handle charcoal as well? Those are options too, and you’ll find a little bit of everything on our list of the best. 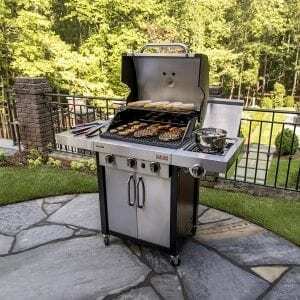 While there are plenty of reasons gas grills are different from charcoal grills, the burner is the biggest difference. This is where the gas comes out, and grills can have anywhere from one to six or more burners under the hood depending on their size. These burners have little holes where flames shoot out and are covered by guards the keep dripping grease from gumming things up. While you may think having a grill with a half-dozen burners is ideal, the materials used in their construction matters along with the BTU rating and overall size of the cooking surface. If you have a 600 square inch cooking area, but only two burners, you’ve got yourself an underpowered grill. Keep the size in mind compared to the number of burners and check to see what they’re made from. Stainless steel is the best in the $500 range while cast iron and other types of metals tend to rust or burn through rather quickly. Cooking zones have to do with the spacing of those burners, and it’s something you’ll hear manufacturers talk about frequently. 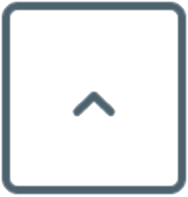 In most cases, you can control those “zones” by merely adjusting the burners – if they’re evenly spaced. Need to crisp the hot dogs but not the burgers? You can simply dial one side of the grill up. One of the key design differences between charcoal models and a gas grill is something called flame tamers. They sit above the burner tubes but below the meat and are essentially a shield or layer or protection. How well they’re made and placement is critical, and they do far more than just protect your burners from grease. Most flame tamers are simple metal bars that keep drips from gumming up the works. Often called flavorizer bars, they run the length of the burner are angled. Stainless is common and top-notch but porcelain coated bars are an option as well. On the flipside, there are full-width flame tamers which cover the entire grill. They provide outstanding protection and more flavor while keeping the heat nice and even. Another critical component of gas grills are the grilling surfaces. 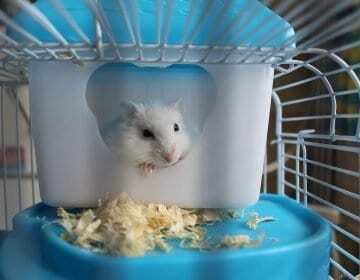 That’s where you’ll put your food, and they will be the bane of your existence if you don’t keep them clean. As you might imagine, some are easier to clean than others, and there are several different styles on the market today. Cheaper grills may come with a wire or welded rod grate usually made from stainless. Another option is coated steel which works but isn’t that great as once the coating chips, the rust sets in. You also have to be careful how you clean them, or you can damage the protective layer. They’re just like the ones you’ll find in a charcoal grill, but no replacement for cast iron grates. While cast iron is heavy, it holds up well for years, and a good cast iron grate will outlive others by decades. They still rust however unless they’re coated with porcelain and will need to be seasoned just like those old skillets. If given the option, always go for porcelain-enameled cast. With some products, this is an area which separates the best from the rest, but that isn’t necessarily the case in the wild world of grilling. The quality of the parts matter, but more often than not it comes down to how you take care of your grill when it’s not in use and directly after you use it. We’re not going to get into grill cleaning just yet, but we will discuss the frame. The best cart-based grills will have welded frames and use the bare minimum of bolts or screws. Powder-coating is common and welcomed although you’ll want to keep an eye out for sharp edges if it’s thinner cheaper steel. A bad corner on a side table can ruin your favorite shirt or give you a nasty cut in an instant. The grease disposal system should be easy to access as well – not jammed under the base at awkward angles. That’s one area you won’t have to worry about with our top choices although you still have to think about the firebox. The firebox is the bottom of the grill and similar to the grated area where you place charcoal on classic models. It needs to be able to hold heat well and withstand rust. It’s usually one of the first things to go on cheap grills, but all our picks pass the test in that regard. Just remember, you still have to perform regular maintenance. Unfortunately, we can’t say the same about the wheels. Most have cheaper plastic wheels that look like they belong on a child’s toy. Look for a cart with four wheels, not just two and uses locking casters. Grill manufacturers are like everyone else and try to use new kinds of tech or slick features to make their product stand out. There aren’t too many bells & whistles you’ll need to be aware of, and most features are quite common across the board. Side tables are something you’ll find on almost every full-sized grill. You can say the same for tool hooks and built-in thermometers. That’s another common option unless you buy a mini. Do you need a side burner to heat up the chili while the dogs are on the grill? 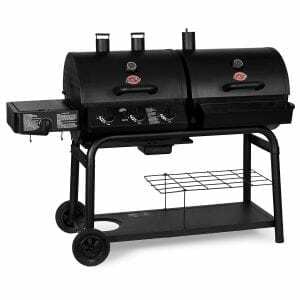 Grills with a dedicated side burner for under $500 are still a little hard to find and are usually lacking in other areas. Folding side tables are somewhat rare as well along with the aforementioned infrared tech. If there is an option you think you just can’t live without, there’s a good chance you can buy an add-on to replicate the feature as well. Weber is one of those rare brands almost everyone has heard of as they’ve been producing grills since the 50s. While the Weber Spirit II E-210 isn’t a traditional charcoal grill, it’s your best option if you’re looking for a medium-sized grill for under $500 bucks. 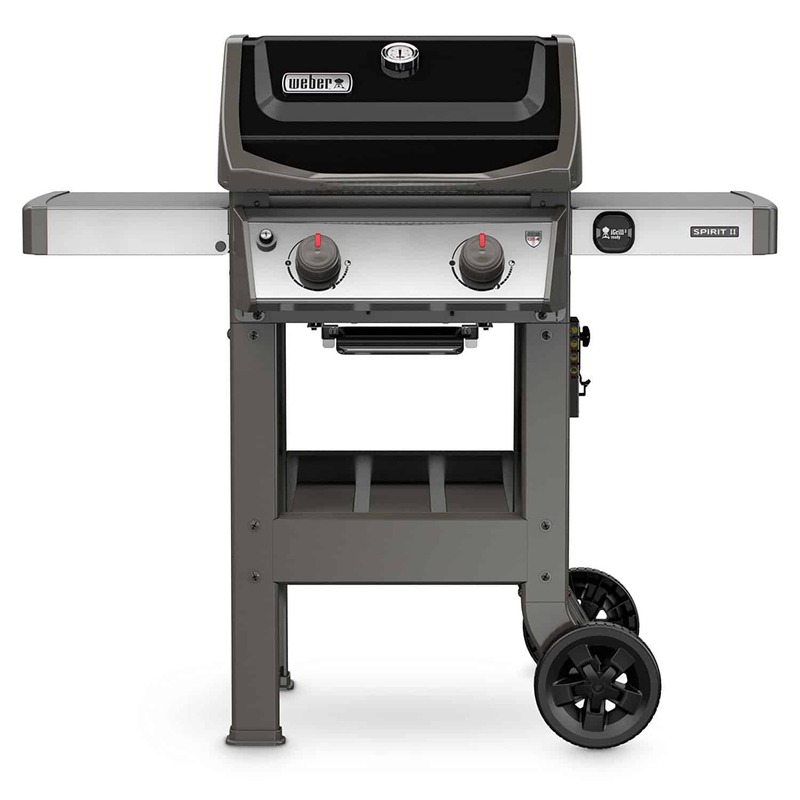 The Spirit II E-210 is a gas grill with a simple, but very modern design. The hood has a more streamlined appearance compared to older models. Your propane tank sits on the outside, so you’ll have a little room for storage underneath to go along with the shelves on each side. The left shelf folds down while the right has tool hooks and gives you access to iGrill 3 if you want to give your grill a brain. Accessories aside, the cart is sturdy and well-built except for in one area. The wheels are not the best but should hold up well due to their durable plastic nature. There are only wheels on one side however and no casters at all so it may be tough to move considering it tips the scales at around 100 pounds. The handle is sturdy, and there is a handy built-in thermometer in the middle of the lid as well. When it comes to grilling, the Weber Spirit II won’t let you down. 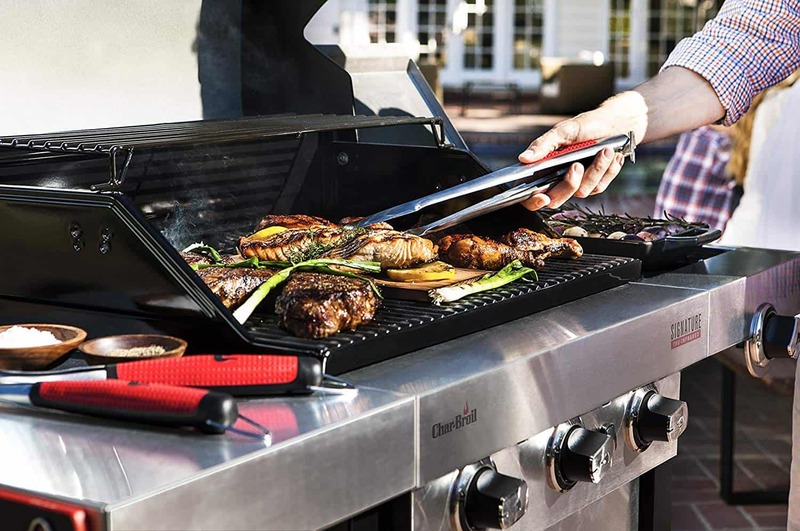 It uses something called the GS4 grilling system which consists of four components. It’s the grease management system, flavorizer bars, infinity ignition system and the burners. The “GS4” moniker is marketing slang, but the components themselves are top-notch. The ignition performs as advertised while flavorizer bars keep the tubes clear from grease while adding a smoky flavor to your meat. This particular model has two stainless steel burners rated at 26,500 BTU per hour with a stainless steel heat deflector. The grease catcher is nothing to write home about, but it is very easy to use. The iGrill 3 is a high-tech thermometer and an add-on accessory for this grill and a few others from Weber. The module attaches to the grill and uses a series of heat resistant probes to let you know when your meat has reached its optimum temperature. You’ll have to download a mobile app, but you will never have to deal with under or overcooked food again. While not included, the Weber iGrill 3 is well worth a look and reasonably priced for what it can do. When you’re ready to throw some food on the grill, you’ll have an ample amount of space to work with. The Spirit has 360 square inches of cooking area on porcelain-enameled cast iron grates that are reversible. That’s great if you want to cook smaller foods or just leave large sear marks on your steaks. There’s also a 90 square inch warming rack up top to boot. 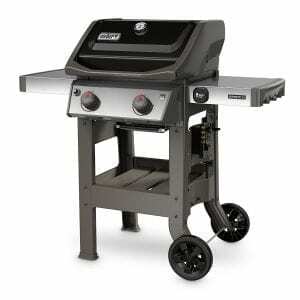 Weber’s Spirit II E-210 grill comes with 10 year warranty to go along with a regulator and hose. We think the user manual is better than most, but you will want to set some time aside to put this one together. You’ll also want to pick up a cover, even if it sits under a deck or in the garage. There is a natural gas variant available, and you can scoop this one up in four different colors with Black, Ivory, Red, and Sapphire. The Fuego F24C is one of the funkiest grills we’ve set eyes upon, and one that definitely lives up to its Pro billing. It’s reminiscent of those classic standing park grills, but with a clean design which keeps everything out of site. Despite the design of the Fuego F24C, it can handle a lot of meat. A 415 square inch grilling surface can hold around 20 quarter pound hamburger patties, and there’s another 110 square inches up top as well. While that may not sound impressive, it is once you factor in the grill’s overall dimensions. 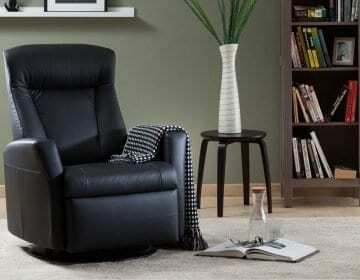 When closed it leaves a 24” x 24” footprint behind which makes it ideal for smaller spaces. People with small patios or decks will appreciate this grill, and it’s effortless to move around. It weighs 90 pounds but has sturdy industrial style caster wheels. They're of the non-marking variety as well, so floors and decks are safe. The design also provides another perk as the Fuego is easier to put together than other propane grills. 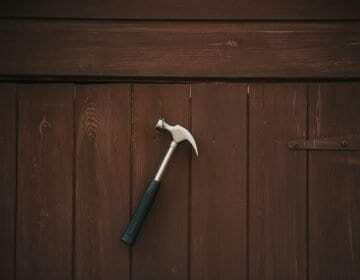 The company says you’ll only need a Philips head screwdriver and around 30 minutes to put this one together. There are 20 screws and clear instructions which means you shouldn’t need help with installation and won’t have to call up a pro. That’s a bonus, and so is the ability to keep those dirty old propane tanks out of site. The doors are sturdy and stay shut once you flip the clasp, but as it doesn’t have an “open design” you won’t get any extra storage. There is a metal handle of sorts you could hang hooked accessories on, but no traditional utensil hangers and no table for your meat. You can pick up a clip-on table as an extra although we would have liked to see something included for free given the price. The warranty on this grill is not nearly as long as we’d like as you’ll get 1-year overall and 3-years on the stainless steel burners. That’s a bit of a downer although their customer support is top-notch by all accounts. It comes with an installation guide but little else, so you will need to pick up a cover for the F24C. There are plenty of other official accessories you can add on as well including a flat griddle top and a conversion kit if you prefer natural gas. We’ve shown you small grills and larger ones built to entertain a crowd. Now we’re going to take a look at something unique from the folks at Blackstone. This grill is a hybrid of sorts and an affordable option with a large open grilling area. At first glance, you’ll quickly notice this grill is not like the rest. For starters, there is no hood although you can cook just as well without one unless you’re trying to do a 3-inch steak. Smoking is obviously out, and the large, but the flat cooking surface will take some getting used to as well if you’ve never used one. Is it a grill or griddle? It’s actually both if you’re willing to buy one simple accessory which is why this grill made the cut. 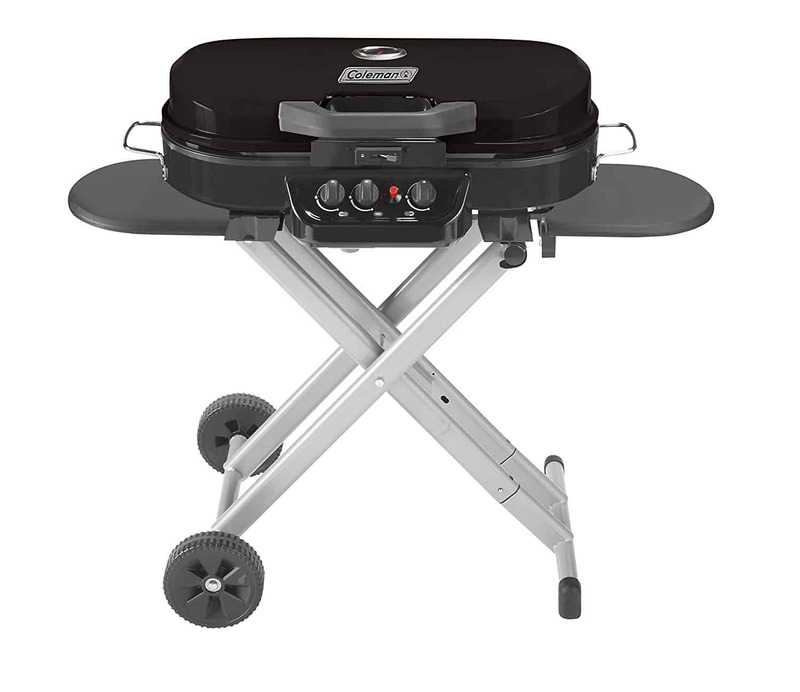 The company sells a 36-inch grill top add-on with a foldable windscreen and drip tray. It’s 680 square inches and covered with a non-stick coating. It’s an affordable option which turns this grill into a 2-in-1 that’s still cheaper than other four burner grills. If you decide to roll with the flat cooking surface, you’ll be impressed by what it can do. From steak and eggs to hash browns, hamburgers or even pancakes, you can cook almost anything on its surface. You’ll have plenty of room as well considering it’s 720 square inches of cold rolled steel. As for the burners, the 46-inch model has four although there are two variants to choose from. Blackstone used a powder coated steel frame for their griddle station, so it will hold up well outdoors. It’s around 130 pounds but has four sturdy locking caster wheels. You can also fold the legs up if you want to hit the road with your griddle. If you need additional accessories, they have you covered as well. While we went with the 36-inch four-burner grill, there are bundles available including one with a cover. The Pro, Deluxe and Starter bundles add extra value to this set, but only if you don’t have the included accessories. In some cases, you’ll be better of purchasing those separately due to the quality although you’ll definitely need a cover for this one regardless. All versions of this grill come with the standard hookups, a user manual, and a 1-year warranty. Whereas the Fuego is built for consumers looking for a smaller gas grill, the Char-Griller 5050 Duo is geared towards folks that want to entertain. While it has a similar sized grilling area to our top options, it has two things those grills lack. Char-Griller may have called this grill the Duo, but it’s really a triple threat. The central area provides you with 438 square inches of cooking space and a warming rack. It’s flanked by two additional cooking areas on each side however with a side burner and charcoal pit. Yup, you can grill with gas and charcoal at the same time while keeping a pot of chili or other ingredients warm on the side burner. Due to the design of this grill, we’re going to break it down into three sections and start with the main griller. It has porcelain coated cast iron grates and three stainless steel burners with a total rating of 40,800 BTU. The electronic ignition will kick things off in seconds, and the side burner has its own dial along with a cover you can flip down when not in use. It also has not one, but two smoke stacks. As for the charcoal side, it has the same sturdy grate system and a warming rack. You can adjust the grates to control the heat and cleanup is a breeze thanks to the lift-out grates and ash pan. We also like the grate lifter in case you need to add additional bricks after the fact. There are 580 square feet of cooking area, and it has a double bottom which improves efficiency as well. It has a single smoke stack, and both sides have built-in temperature gauges on the lids. Now for a few negatives as no grill is perfect, including the Duo 5050. It’s going to be heavier than most at 168 pounds, and while we dig the open storage and condiment basket, we aren’t big fans of the car itself. It has an older tubed design with only two cheap wheels so moving it can be a pain compared to models with casters. If you treat it with care and keep it covered, you shouldn’t have anything to worry about, but we would have liked to have a sturdier base on this beast. 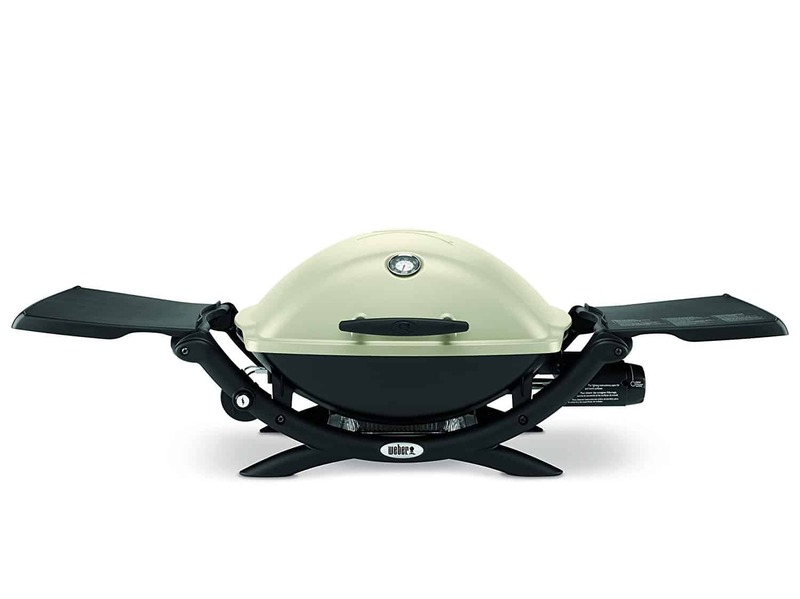 Aside from the base, it’s an excellent grill and provides significant bang for your buck given the side burner and the fact you’re getting two grills for once price. The Duo comes with all the hookups you’ll need to get started, and a user manual you’ll be thankful for as there’s a lot to deal with. It also has the company’s outstanding 5-year warranty which covers defective parts along with any potential burn and rust-through damage. Every grill on our list is portable to a degree although some made to toss in a trunk… not a truck. The Weber Q2200 liquid propane grill certainly falls into that category, but don’t be fooled by its stature. This little grill can cook with the best of them and can work with both disposable and refillable LP tanks. This stylish cooker won’t take up much space on your deck or in the car as it only measures 26” x 51.4” x 25.1” with the tables fully extended. It weighs 43 pounds so it’s what we would refer to as stout, but still easy to carry. The weight is due in part to the build quality, which we’re pleased to say is outstanding. Weber went with a glass-reinforced nylon frame for the Q2200. 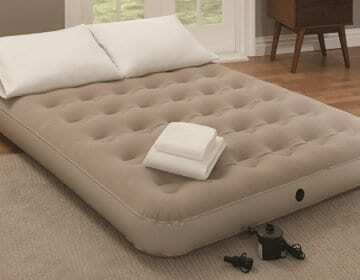 The body is made from cast aluminum along with the lid which has the standard built-in thermometer. 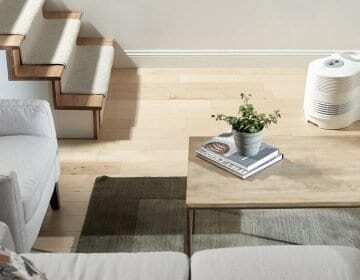 Those side tables fold down when not in use, and the base has a slot of the bottom to catch any runoff. But aluminum is lightweight, isn’t it? Aluminum is great when you want to keep things light, and there’s plenty of it in this grill between the lid and base. The real weight comes into play with the porcelain-enameled grates which are cast iron with attached. You’ll get two of them which provide a total of 280 square inches of grilling space. That’s enough for around 13 burgers if you don’t make them too large. This grill has a single stainless steel burner rated at 12,000 BTU per hour. You can fire it up with the push button electronic ignition in a second, and it heats up just as quickly as you’d expect. The grease catching system is nice, but the pan is flimsy aluminum, so you’ll need extras eventually or a more permanent solution. As you can see, this griller was able to put together the Weber Q2200 in less than 4 minutes which is impressive, to say the least. The cart you see in the video is available as well if you want to extend its range and save your back when camping. The other accessory we want to mention is one you’ll want to consider seriously. A propane adapter like this one from GasSaf allows you to use full-sized tanks instead of those tiny propane camping canisters. 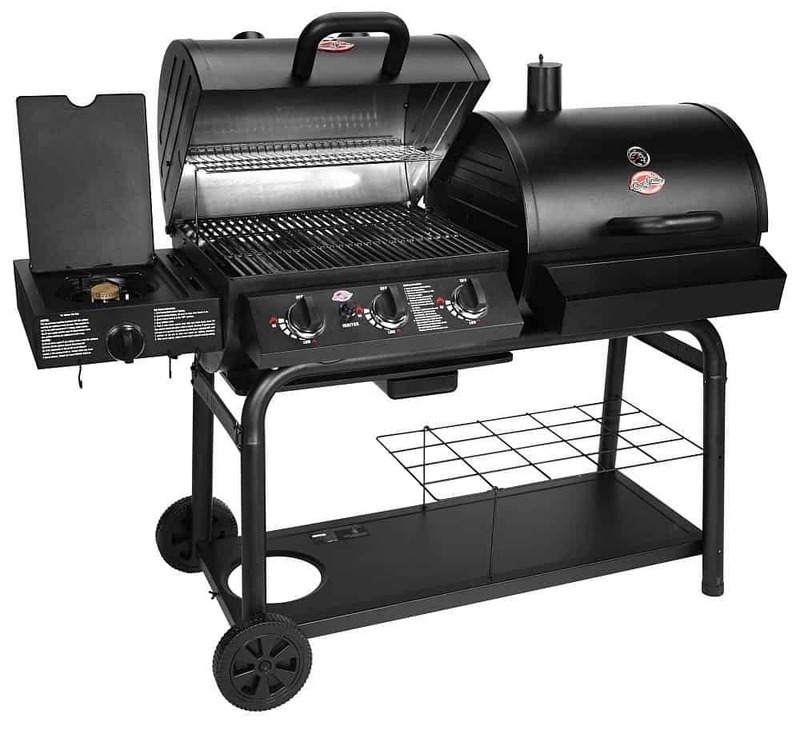 This grill comes with Weber’s 5-year warranty which is good on the body, grates, burner tubes, lid and firebox aside from fading or discoloration. A 2-year warranty covers the rest, which is better than you’ll get from many manufacturers. Like most grills, the Q2200 comes with an owner’s manual and hose out of the box. 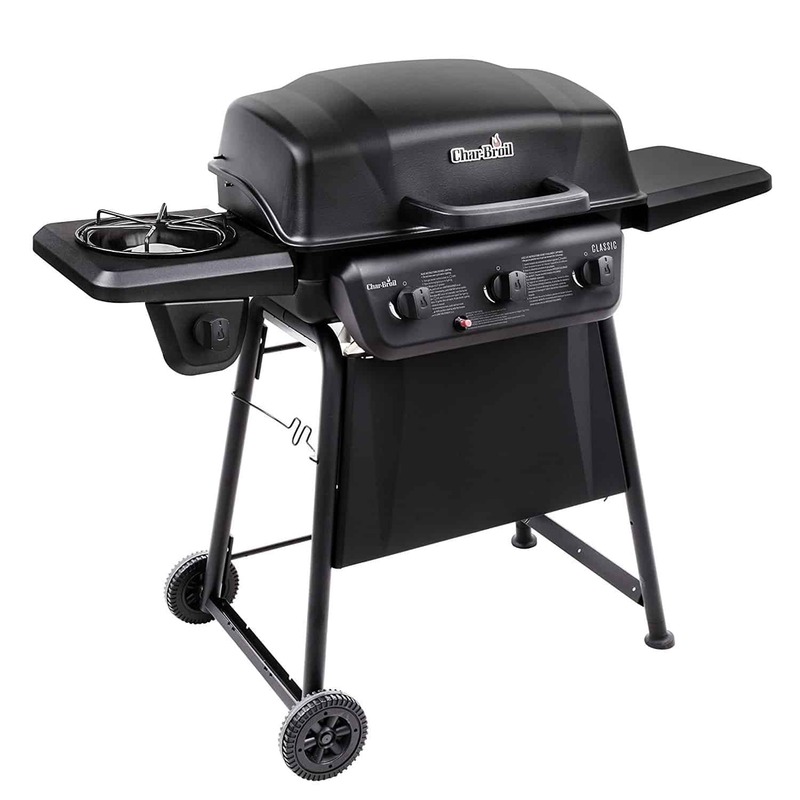 If you need a simple grill that looks good on your deck, you can’t go wrong with the Char-Broil Signature TRU 420. 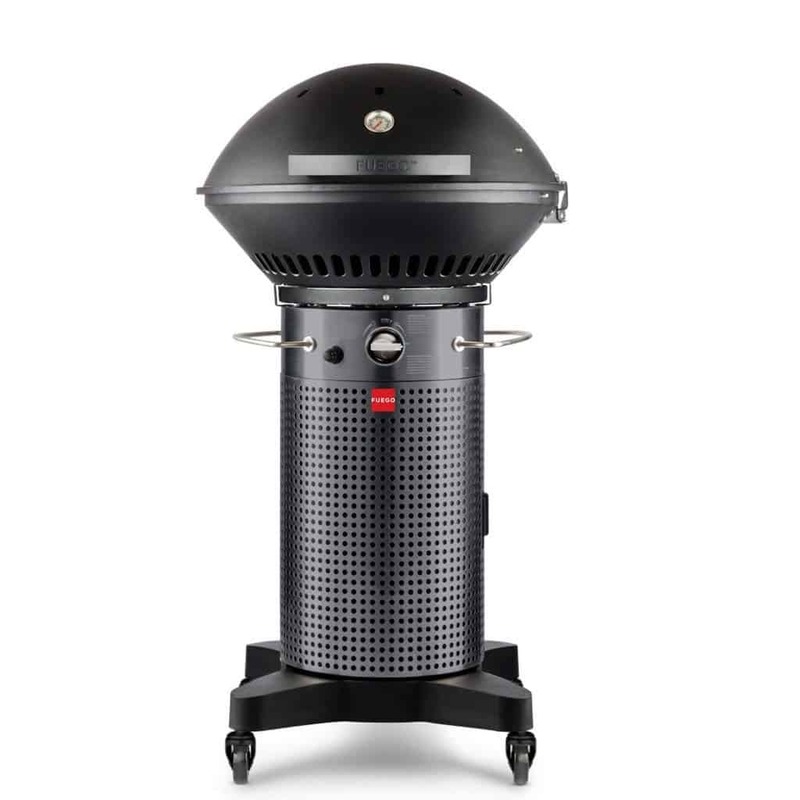 This stainless steel beauty grills with the best of them and has an interesting feature under the hood as well. 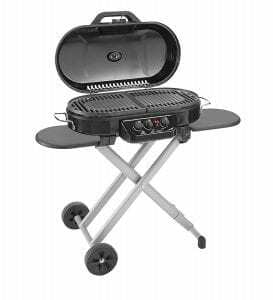 On the outside, the TRU 420 is a regular grill although one with a bit of class. The company went heavy with the stainless steel, and the two-tone design looks good with the black metal and stainless. While not the sturdiest, it’s going to hold up well outdoors provided you take proper care of it. It’s fairly compact as its only 51-inches wide but heavy at around 150 pounds. Thankfully, this grill has a solid set of caster wheels, and two of them lock. We also like the enclosed storage area which hides the tank. The shelves are standard and won’t disappoint although they do not fold down like other models. Overall, it’s a slick well-built grill that’s easy on the eyes. While infrared tech is nice when even heating and flare-ups are a concern, you won’t get far without good burners under the lid. This one has three top-ported 443 stainless steel tubes capable of 25,500 BTU. It provides more than enough heat for the 420 square inch cooking area which features porcelain-coated cast iron grates. There are an additional 155 square inches up top for low heat cooking and warming as well. The Char-Broil Signature TRU 420 isn’t the fanciest grill around, but it looks like it and performs as advertised. 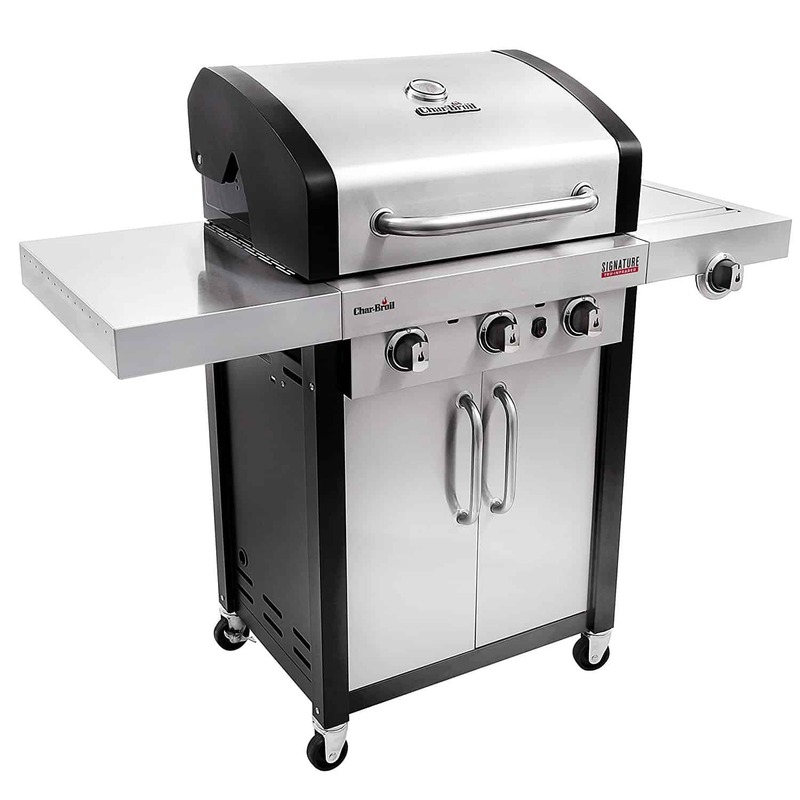 It has a reasonable price tag to boot even if it’s a little underpowered compared to other grills in this class. 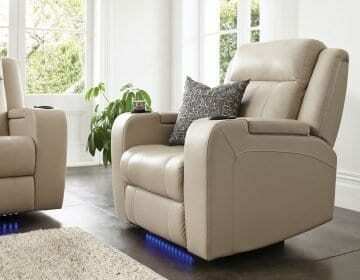 Some owners also felt it was difficult to assemble compared to similar models. As you’d expect, no cover is included so you’ll want to pick up something like this Rip-Stop Cover which fits this model perfectly. You will get a user’s guide, and the grill comes with a 3-year warranty on the main components, 10-years on the burners and 1-year for everything else. Our second portable option shares some similarities with the first, but Coleman built this one for the road. The aptly named Roadtrip 285 will take your grilling game to an all new level and has more burners than other mini grillers in this class. When you buy a small gas grill, there are usually a few drawbacks. The BTU and burners can be underwhelming, but not the on the RoadTrip 285. You’ll get three burners with independent controls on this tiny wonder for a total of 20,000 BTU. You can go as low as 3,250 and have 285 square inches of space to work with. The grating is in two pieces with built-in grease cards which direct the flow to the pan below. They tame the flames and will hold up well considering they're cast iron and covered in porcelain. You can also swap them out half or the entire plate for this griddle top. That’s handy, and so is the wheeled convertible stand. 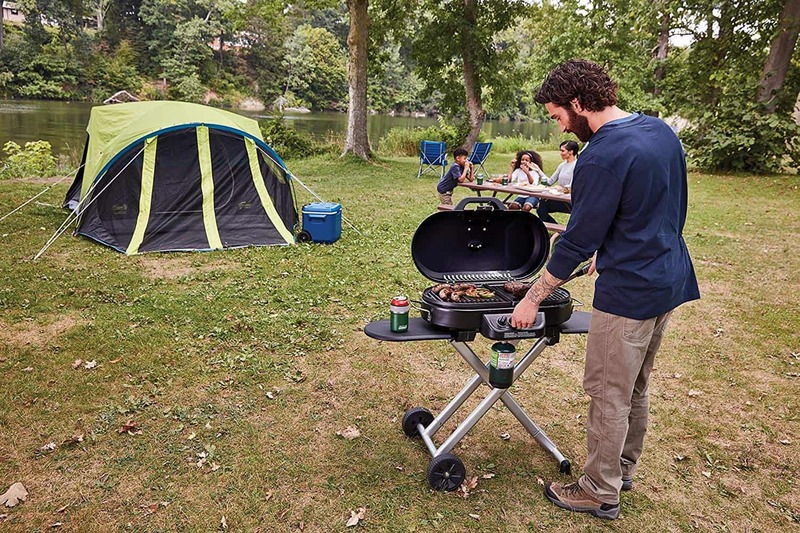 The metal stand allows you to wheel this grill wherever you roam. It collapses in seconds as well, so it’s easy to store whether you stand it upright in corner or slide under a table when not in use. It’s a good design overall from the cart to the sliding side tables. As usual, we wish the wheels were more rugged, but it’s really our only complaint with the design. The Coleman RoadTrip 285 does have a lower profile than the Weber and measures 30.2” x 19.2” x 16.1” with a weight of 46 pounds. It works off the standard 1 pound propane canister, but you can adapt it for use with larger tanks as well. Other features to note include a thermometer in the lid and an InstaStart ignition system. While it’s not the cheapest portable grill, the RoadTrip 285 is powerful and easy to move around. It’s the perfect solution for seasonal grillers as well considering it won’t take up much space when folded up and tucked away. The grill doesn’t come with any extras, but you will get a user guide and a 3-year warranty. Even with a price point of $500 bucks, you still have to consider all the extras you may need for your new grill. That can put you well over the tipping point, but it won’t be an issue with the Char-Broil Classic 360. It’s our budget-friendly pick, and one we think you’ll be thrilled with if your funds are low. The Classic 360 is a basic grill with one flagship feature. 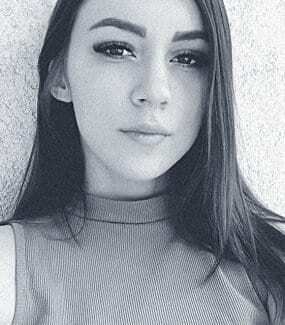 Before we get to the high points, we’re going to talk about the big drawback with this particular grill. It has a cheap tube frame with thin sheet metal and thick plastic wheels. While it’s a downer, it shouldn’t be a deal breaker if you simply keep the 360 covered and cleaned. The rest of the grill should hold up well as it has a porcelain-coated steel lid and firebox. While you will only get 360 square inches of grilling space and wire grates, they're coated in porcelain. There are three evenly spaced stainless steel burners to go along with three dedicated flame tamers. There’s a coated 170 swing rack up top for warming but no thermostat built into the lid oddly enough. 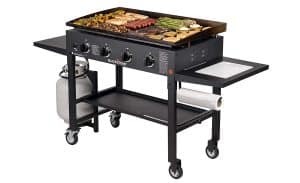 This grill has a table on one side for prep work or storage while the other side sports a dedicated side burner. This little unit can get up to 8,000 BTU and is a standout feature which makes up for that tube frame. When combined with the three main burners, you’re getting over 38,000 BTU of heat for half the price of other gas grills. Char-Broil may have cut a few corners with the 360, but it will grill a good burger or steak just like the rest of our picks. The user manual says you’ll get a 5-year warranty on the burners, 2-years on the firebox and lid and a year on all other parts. As always, you’ll want to snag a cover, and this one should do the trick. If you’ve walked this earth long enough, you’ve probably put together a few things in your lifetime. Whether it was a desk for your dorm or new bikes for your kids every few years, assembly can be an absolute nightmare with some products. While we’d love to tell you all grills are simple to set up, that’s not the case. It’s a mixed bag, and you could be in for a rough ride if you’ve never put together a grill. 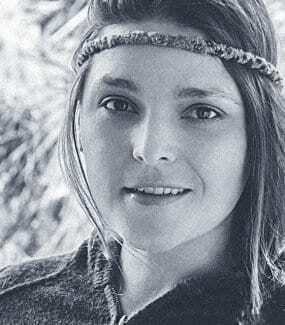 There are no universal guides either although you can find videos online of the more popular models. The manuals are also hit or miss as we’ve seen some that look like they were written by someone with no comprehension of the grill itself. Those large exploded diagrams are helpful, but only if you can actually read the part numbers clearly. Considering it uses a flammable substance, it’s not the type of thing you want to rush, so set a few hours aside for assembly. If not, you could end up voiding the warranty. A good warranty is always important whether you’re buying a toaster, smartphone or even a grill. Any product with moving parts can experience wear and tear. Grills may not move much, but fire and the elements create their own special kind of havoc. 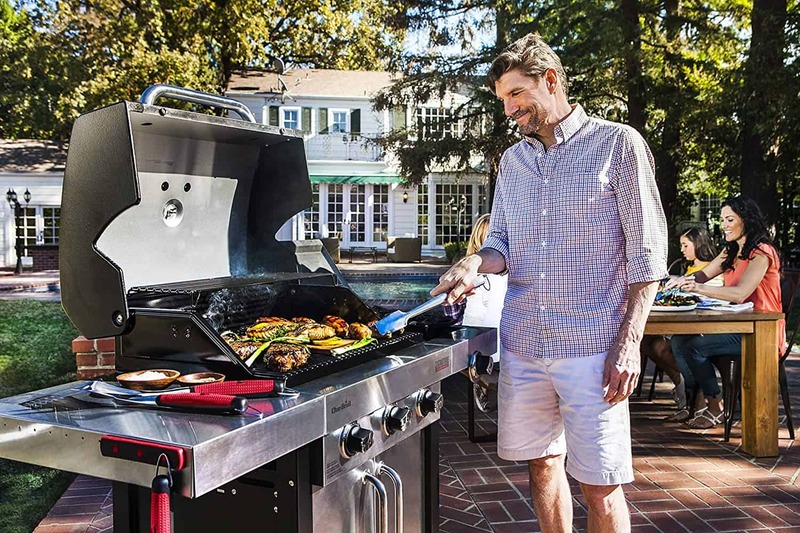 A warranty on a gas grill can range anywhere from 1-year all the way up to 10-years. Although those are far from common. The main thing to keep in mind with a warranty is to read the fine print and see what parts are actually covered. Many times the burners will have a longer warranty than “basic” parts like knobs or handles while other parts like the grates or frame have a separate length as well. That information can be hard to dig up at times, but you can usually find it in the user manual included with the machine or online. We’ve included links to the latter for every product on our list. Unless it’s a bundle package, a cover should be the first thing you purchase and something we highly recommend. Well, you won’t need any charcoal unless you purchase a 2-in-1, and you can leave the lighter fluid on the store shelf as well. If you don’t currently own a grill, pick up a good set of grilling utensils or cook wear. You can find a cheap set for less than a Jackson although you’re better off buying something that will last several seasons. Stainless is the top choice, and if you want something industrial, you’ll want to give this set from Alpha Grillers a look. We also advise you to pick up a good meat thermometer, and a digital one will save you a lot of time. A grill cleaning brush is the only other “must have” accessory we recommend, but you’ll want to get one rated for the grill surface – don’t just buy a box of brillo pads. We’ve already stressed the importance of keeping your grill covered and cleaning those grates. Unfortunately, there’s a bit more to it than that as other parts of your grill need to be maintained if you want it to last more than a few seasons. You will need to clean your burners on occasion along with the venturi tubes. They make brushes for both although we advise you to follow the manual with the latter or you could void your warranty on the burners. They make manuals for a reason… even if they’re hard to decipher at times. Well, they tend to take give out in time as they get heat from below and grease from above. You’ll need to clean those as needed and replace them occasionally as well. Thankfully they’re cheap, and you can usually find third-party options if parts ever become an issue. There’s a point where you’ll want to stop scraping those down and seasoning grates and simply pick up a new one. Don’t get lazy with the grease trap, no matter how nasty it may be. It can be tempting to call it a day once the food comes off the grill and the tank’s turned off. As soon as the grease cools, you’ll want to dispose of it. If it overflows, you can ruin your deck or have a major mess on your hands. No matter what type of grill you have your eye on, always remember to keep safety in mind when using any type of grill. It doesn’t matter whether it’s grand or one of the best grills under $500 bucks, keep anything flammable away from those open flames including any unicorn sprinklers. Also, keep your needs in mind and buy accordingly, don’t try to impress the neighborhood if you only whip out the grill for a few months each summer. Weber is a brand consumer’s turn to yearly when grilling season arrives, and the Weber Spirit II E-210 is the best overall grill in our opinion. It’s a great cooker for beginners as it’s easy to operate and comes with an excellent warranty. 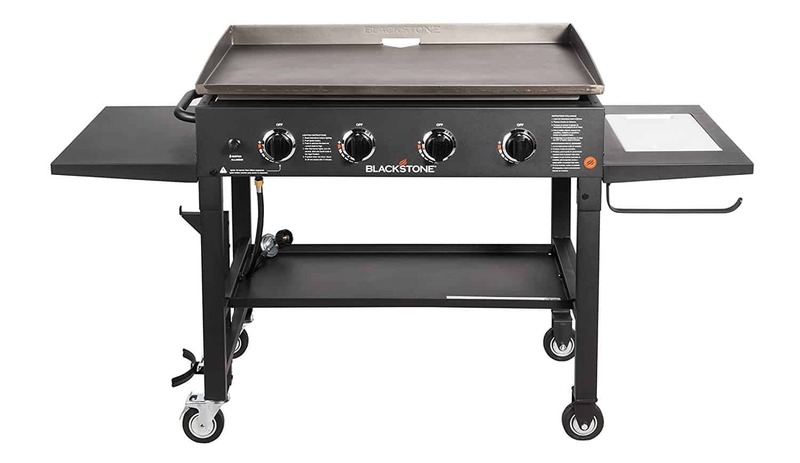 The Blackstone Flat Top grill is actually a griddle grill, but one that allows you to use a grated system as well. It’s one of the more modular grills we’ve come across, and ideal when you need a big cooker that can do it all. Should I clean my grates when they're hot or cold? Cold despite what others may tell you. While you can clean them hot, you increase the chance of burning yourself or damaging the surface if it’s covered in porcelain. How do I know when steaks or other meats are done? That’s an excellent question with a tough answer. People generally say, “it depends on the thickness” and while that’s true, there are official guidelines to follow for safety. Listen to the USDA, not a web expert. Can my grill be converted to natural gas? You can convert almost any type of grill that runs propane to run natural gas as well. In fact, many manufacturers sell conversion kits for their specific systems or offer an NG variant. While you won’t have to deal with propane tanks, it can be a costly conversion depending on the installation and options like quick disconnects. Yes, but only when used properly. There are dozens of things you’ll need to keep in mind with propane instead of charcoal, so this is another area where we’re going to refer you to experts in the field.